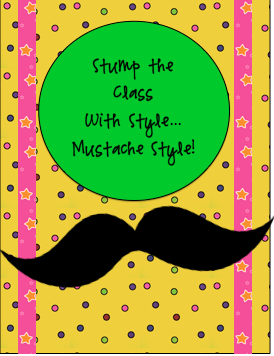 Fabulous 5th Grade Fun: Stump the Class..."Mustache" Style! Farley over at Oh' Boy Fourth Grade...is having a mustache linky party. How fun! I "Mustache" you a Question! Have you ever played "Stump the Class" with your students? Every so often, I play "Stump the Class" with my students. After we have covered a skill/concept, I post question frames for my students to use so they can create questions to ask the class. What a great way to assess the class and no prep work for me! Now, we are going to do it with a mustache! Much more sophisticated! You can link to the document on my TPT page. It's free! LOVE IT!!! thanks so much for linking up!!! Thanks for the idea! New twist on an old idea. I love the Mustache you a ? idea!! I see you're a very newbie blogger like me. :)Good luck with your blog! Please come and visit me at www.groovyin3rd.blogspot.com, www.facebook.com/groovyin3rd, or www.pinterest.com/tammytweten. I'd love to have you as a follower. Thanks! I'm trying to learn about the world of blogging. I'm heading over to your site! Thanks for joining my blog. I'm heading over to yours. This is so cute! I love your blog and your Tpt store! I'm your newest follower! The Honey Bunch did a fantastic job designing my blog! Major kudos to them! Thanks! Getting to Know Your "Who"